Brown County, Wisconsin is located between Sturgeon Bay and Appleton on the Eastern Middle part of the state. Brown is more of a Green Bay Packers Territory than anything else with plenty of frontage on Lake Michigan a couple larger communities including; Green Bay, Bellevue, Ashwaubenon, De Pere and Suamico to name a few. It's surrounded by 6 other Counties; Oconto, Shawano, Outagamie, Calumet, Manitowoc and Kewaunee. On this page you will find Land Contracts, Owner Financing, Contract for Deed, Rent to Own, Seller Financing and Deeds of Contracts for Houses, Mobile Homes, Log Cabins, Farmland, Farms, Waterfront Property Lakefront Lots, Commercial Businesses, Cheap Land, Hunting Acreage and City Lots. These properties are located in the county and are listed by real estate agents. 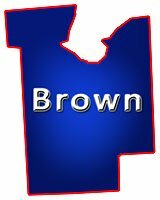 You will also find Brown County, Wisconsin GIS MAP Information! Brown County Wisconsin - What is a Land Contract!